For this month's "Maps Of The Month" featurette, I wish to draw your attention to Rick Brun's F-Zero (Super NES) maps. Thus, Rick Bruns had to grab these graphics as they actually are (as if a bird's-eye view), not as they are presented during the race. But these are extremely handy. When you're driving at hundreds of kilometers a second, it's good to know when the turns are coming up, especially the sharp ones! If you didn't experience the game at the time, don't fret! F-Zero is one of the select few games to make it onto the Super NES Classic Edition, so you can still put the pedal to the metal, assuming you are able to get a hold of one. 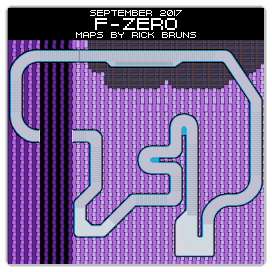 So for revisiting this Super NES classic, Rick Brun's F-Zero (Super NES) maps will be known as VGMaps.com's Maps Of The Month for September 2017.